Isn’t it amazing how much of an impact food can have on our mood? As a big food fan, I’ve always known this, but I hadn’t quite appreciated the extent of what GOOD food could do to my mood – confused? Since January, we’ve been trying to eat a little better at home – more veg, less meat based dinners, more fruit, less chocolate biscuits. I have not by any means cut out the junk – I think I have probably had a banana milkshake from my local dessert shop every Saturday for the last 4 weeks now… but we have started making a conscious effort to try and eat a little more fresh, making meals from scratch rather than relying heavily on pre-made, packeted food. The reason we started this was because we decided it was time to get a little healthier and be a bit more mindful of what we were putting in our bodies; but there has been an amazing impact on me that I hadn’t even realised I needed – my mood! Have you ever felt really happy and positive and full of life and realised, woah, if this is what I feel like now, what did I feel like last week? 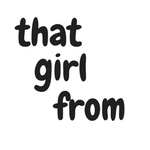 Well, it happened to me – I hadn’t realised how down in the dumps I’d been feeling about my body image and just generally recently until this weekend when it clicked – I was sat at my piano, singing for the first time in a very long time, and I thought, I’m really happy, I’m really content, I feel really good! And it was then that I realised, taking better care of myself physically has lead to this massive mental boost, and I feel absolutely amazing. Not only have I been eating better but I’ve also been working out – what?! It was my new year resolution to actually do weekly exercise again at least once a week, and I asked for a Fitbit for Christmas to try and motivate me to actually stick to it – it actually worked! And again, I really feel like just a small physical change has made a huge difference to me mentally these past few weeks, it’s crazy really. I’m also trying to spend less time infront of the tv when I get home from work, which is really easy to do if you’re helping your mom cook and then doing some physical exercise (lol) and I again really think is helping – you’d never know it but did you realise watching soaps where everyone constantly seems to have terrible news, seems to make you feel a little blue?! Anyway, what have we been eating? Here are a few pictures of meals from the last few days, all of which I have loved – you’ll notice lots of veg, and more fish than chicken! We’ve actually been steaming most of our food recently which is an extra bonus as everything cooks at the same time, it’s really easy to do and everything turns out great! 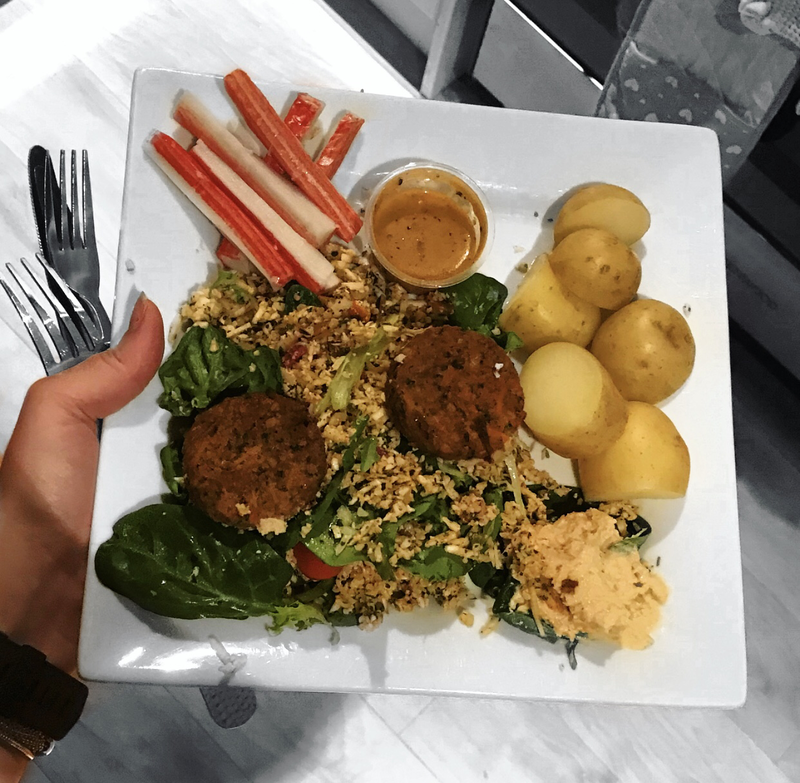 Last night: we had these beautiful salads from Co-Op (reduced, 40 pence, absolutely bargain) which comes with falafel, houmous, bulgur wheat, spinach, tomatoes and harrisa, it was so tasty! We paired it with a few baby pots (steamed) and fish sticks (fave). 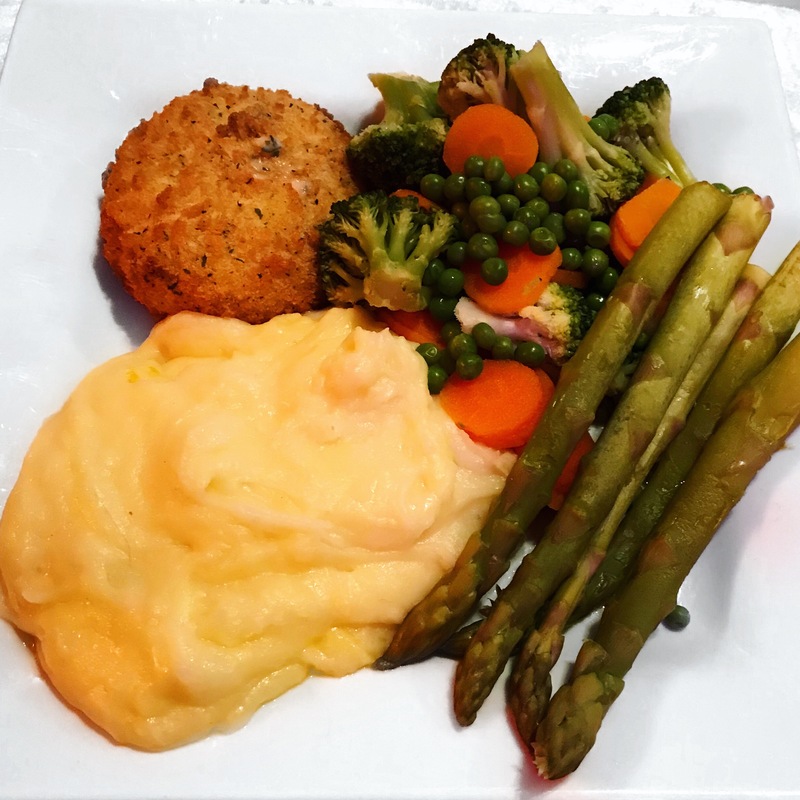 Saturday: parsley filled fishcake with fresh asparagus, broccoli, carrots and peas (all steamed) with some cheesy mash – I really fancied cheesy mash. DELICIOUS. 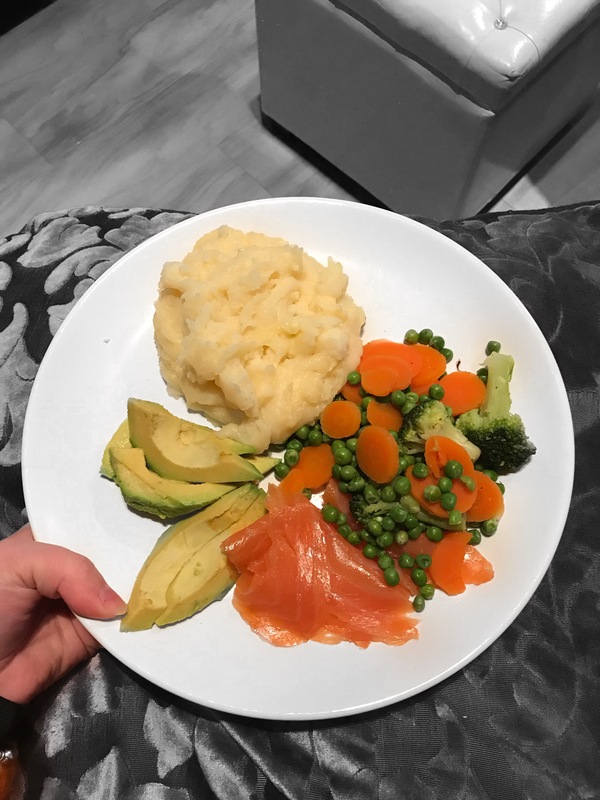 Sunday: Smoked salmon, more veg, more mash, avocado – SO GOOD.